SEOUL, Feb. 14 (Yonhap) -- A South Korea-Japan territorial row rekindled by the Shinzo Abe government's textbook revision efforts on Tuesday is expected to further strain bilateral relationship already weighed down heavily by the discord over the wartime sexual slavery issue. Tokyo's education ministry released a draft of the government guideline for elementary education textbooks earlier in the day, requiring all social study course books to state the South Korean islets of Dokdo belong to Japan. The guideline announced on Japan's e-government website will be put to a month-long public review before being made official in March and be applicable from 2020. The South Korean government condemned the revisionist move quickly and vehemently. "We cannot but deplore Japan's repeated claims to our territory, Dokdo, in its draft version of a revised guideline... and we demand its immediate withdrawal," the Ministry of Foreign Affairs said in a statement issued shortly after the announcement. "Dokdo is our territory historically, geographically and by international law," according to the statement. The ministry's director-general for the Northeast Asian bureau also brought in Hideo Suzuki, a minister at the Japanese Embassy in Seoul, to the ministry to lodge a formal complaint. Dokdo is a set of rocky islets which lies closer to South Korea in the waters between the neighbors. South Korea reclaimed Dokdo with its liberation from the Japanese colonial rule from 1910-45 and currently keeps a police presence on them. The islets have long been a recurring source of diplomatic tensions between Seoul and Tokyo, but the latest bout of tensions couldn't have come at a more awkward time. Even before the renewed territorial tension, bilateral relations have been experiencing difficult times over the unresolved issue of Japan's colonial enslavement of Korean women. The decades-long liability and compensation issue involving South Korean victims came close to settlement in late 2015 with a bilateral agreement designed to inject Japanese government funds into a South Korean foundation supportive of the so-called comfort women. But they failed to negotiate Tokyo's demand to remove a symbolic statue of a victimized girl in front of the Japanese Embassy in central Seoul and the addition of another girl statue near the Japanese consulate in the port city of Busan that further fueled the row. In the wake of the feud, Japanese Amb. 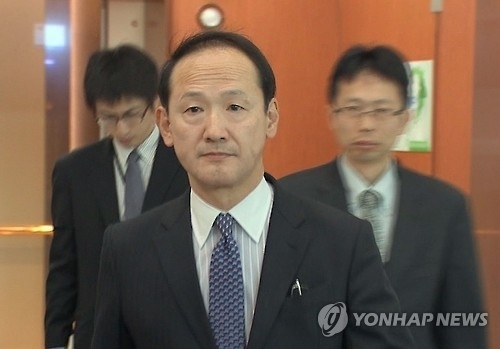 to Seoul Yasumasa Nagamine left South Korea on Jan. 9 in protest and has yet to return to his post. Despite such developments, there is growing calls for resolving outstanding differences in the face of new security challenges posed by North Korea's ballistic missile test from the western North Pyongan Province over the weekend. Using a mobile launcher, the intermediate-range Pukguksong-2 missile is seen as having made tangible strides in its pursuit of an intercontinental ballistic missile as well as the military capability to launch a nuclear attack without being detected in advance. In his first summit talks with Japanese Prime Minister Abe last week, U.S. President Donald Trump called for trilateral cooperation of Seoul, Washington and Tokyo in tackling the North Korean threats. Following up on the North Korean missile launch, the defense ministers of the three partners agreed earlier in the day to cooperate closely in sharing information on and responding jointly to North Korea's missile threats, an important development that came despite the tension between the Asian nations. This week will provide an opportunity for fence-mending between Seoul and Tokyo, with their top diplomats likely to sit together for rare talks on the sidelines of the foreign minister meeting of the G20 countries and the Munich Security Conference scheduled to take place from Thursday to Sunday in Germany. The foreign ministry here said the top diplomats of South Korea, the U.S. and Japan will hold a separate trilateral meeting on the fringes of the G20 gathering in Bonn which runs from Thursday to Friday.